A returned dog is one who has been brought back to Paul (the kennel master) for any number of reasons. Daisy was a “returned dog.” Now Daisy is our dog. She is four years old: at 2 she was adopted, at 3 she was returned to the kennel, at 4 we took her. She had been at the kennel so long that Paul no longer remembered why her owners had returned her in the first place. Often it’s not a behavior problem. In fact, Daisy always kept her crate clean and was very quiet, “no bother at all,” as Paul put it. (ed. note – based on a recently found note, the original adopters apparently had to return her for personal reasons; they were painfully upset over having to do this.) 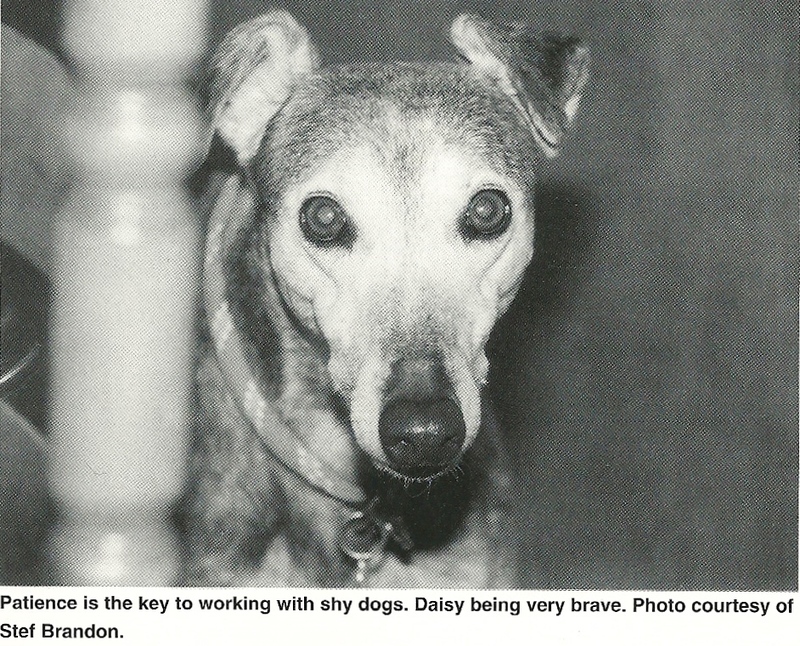 When I asked why no one in a whole year had even walked her or thought about taking her, Paul said, “There were always too many ahead of her.” You see, Daisy is not pretty as greyhounds go and she is shy. Well, Peter and I learned long ago that within a week, any pet we take in looks as beautiful to us as any “Best In Show” at Westminster. And while I had to drag Daisy out of her crate on a leash at first, I was confident that she’d come around. As it turns out, Daisy has been the perfect dog. There were no housebreaking problems, she already knew stairs, and she has happily learned our routine of feeding and turn-outs from the rest of our pack. She is pudgy but not fat. Overweight when we got her, we’ve had her on a diet, and while she has lost some weight, Daisy will never have the lithe, lithesome figure some of our others have. She’s just stocky. She’s a dark brindle with fairly irregular markings which make her seem more mottled than striped. And she has one of those good-god-these-dogs-grey-too-early, all white faces. I ask her daily when she will remove her mask and reveal her true self to us. But we have seen her true self and it is beautiful. She learned her name in the first week and “come” in the first two days; she never jockeys for a higher place in the pecking order, so there’s no snarling. She rears up on her hind legs in the yard, engaging our “Little One” (Tripod) in some much-needed exercise. She loves the outdoors more than any other greyhound we’ve ever had. She will dig herself a hole and lounge under the shade of the trees for hours sniffing after birds and squirrels, all on her own. None of the others are so independent; the other four cannot bear to be in the yard without human companionship. At first very shy, now Daisy comes to us for love and affection without being called. And she is first, well maybe not first, but second or third, at the door with tail wagging when we get home, content to be whipped in the eyes by other tails until we can get through the crowd to pet her a greeting. She’s even started barking for breakfast. We are amazed at the boldness this once-shy little girl is showing. Not every dog rescue group takes back the dogs it has placed, but WAG does because we feel a strong sense of responsibility for our greyhounds. Sometimes folks return dogs for sound reasons: a death, illness or other family emergency may force folks to move or go back to work and no longer keep their greyhound. WAG wants to help both client and dog in these situations. Sometimes the return reasons seem not so sound. People simply no longer want their dogs. Dogs are a long-term personal and financial commitment and people don’t always understand how tough this responsibility can be at times. I used to think there were bad dogs, some you just could not rehabilitate. There are some of these, I know. I’ve seen them at the kennel. But there are not so many as I used to think there were. Most of them can be saved if you only look at the world through their eyes. When you think of getting a second or third, even your first, ask Paul if he has any “returned dogs.” Maybe you’ll get a Daisy–What a treasure! She’s no bother at all, and now there’s no one ahead of her.